A stabbing spree in Taipei. A rash of shootings in gun-controlled Chicago. When we see mass violence in the news, we can be fairly certain that peace-loving Pallas is astrologically compromised and that the Bloodbath Formula is in effect. Here's a chart and formula for the Taipei incident, which applies also to the malaise in Chicago. 1. Pallas sesquiquadrate Pluto. Weak, hence the relatively minor events. 2. Mars, ruler of Venus, quincunx Neptune. 4. Pluto semisextile Moon and square her ruler Uranus. 5. Sun parallel/sesquiquadrate Pluto. Fastest-moving and probably the "trigger". 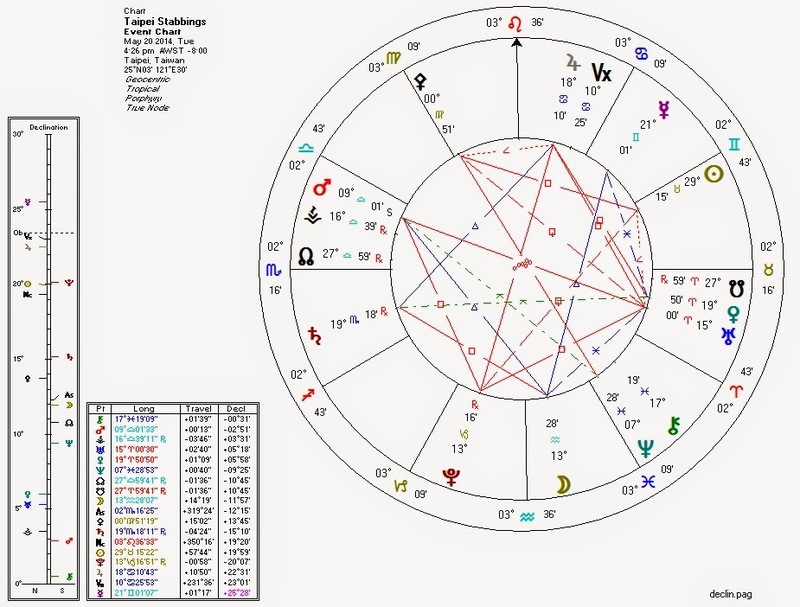 Pallas rules libertarianism and non-aggression in astrology. The two terms are synonymous both in astrology and in life: it is impossible to have one without the other. The wise seek both. astrolibertarianMay 22, 2014 at 12:42 PM Also: http://www.infowars.com/dozens-killed-as-pakistani-jets-bomb-suspected-militant-hideouts/ ReplyDelete astrolibertarianMay 22, 2014 at 12:45 PM And: http://www.infowars.com/dozens-killed-as-blasts-rock-open-market-in-northwestern-china-photos/ ReplyDelete astrolibertarianMay 22, 2014 at 12:47 PM Also: http://www.infowars.com/thailand-military-seizes-power-in-coup/ and: http://www.infowars.com/koreas-exchange-fire-near-disputed-sea-boundary/ ReplyDelete astrolibertarianMay 24, 2014 at 4:01 PM http://www.nbclosangeles.com/news/local/shooting-isla-vista-uc-santa-barbara-260505021.html http://hosted.ap.org/dynamic/stories/E/EU_BELGIUM_SHOOTING?SITE=AP&SECTION=HOME&TEMPLATE=DEFAULT&CTIME=2014-05-24-11-38-57 More killings, under more or less the same configuration, with the approaching quindecile between Mercury (ruler of Pallas) and Pluto adding to the mix. Mars, ruling Venus, square Pluto takes over for the the Venus-Pluto square, etc.